room to grow: How To Make Your TV Disappear! The TV can be a source of frustration- especially for those living in a small space. Aesthetically, it's not the most pleasing element in a room- especially amongst beautiful vases and orante accents. Some will purchase expensive entertainment units to hide their TV when not in use. Others will mask it by propping up a removable piece of art in front of it. But, for a cost effective and dramatic way of disguising your TV, why not paint the wall that it rests on black? Black paint will create the illusion of a solid wall, and will create a solid focal point. It especially works well if you have bulky media equipment as well. 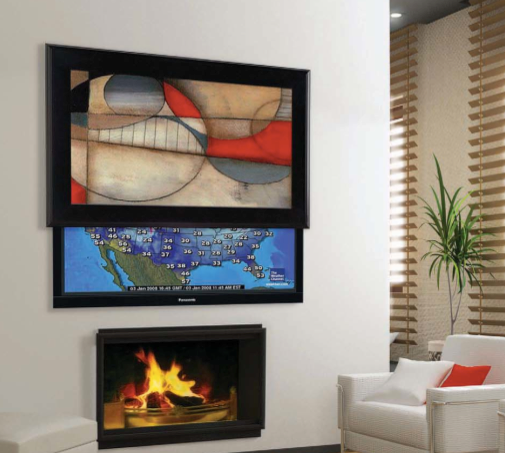 It probably won't work in all homes- ideally, it will work best if your TV is propped on a wall that is small, and accented with white and bright colors.